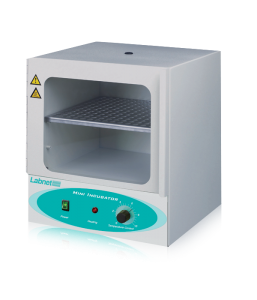 Designed for simultaneous heating and mixing of small samples, the VorTemp 1550 is supplied with interchangeable platforms for standard 15ml and 50ml conical tubes. Maximum capacity is 8 x 50ml or 18 x 15ml. 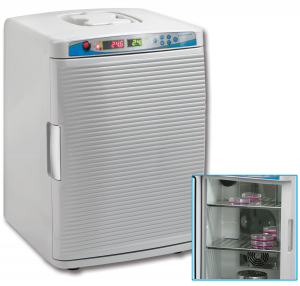 Temperature in the VorTemp 1550 is adjustable over a broad range, making the unit useful for a variety of applications, including bacterial cultures and digestions. Mechanical convection provides a uniform and stable environment within the chamber. The VorTemp 1550 may also be used in the cold room for sub ambient applications. Shaking speed and acceleration rates are adjustable as well. Acceleration can be set to three different levels to protect delicate samples. A microprocessor controls all parameters including temperature and timed operation. Self diagnostic software continuously monitors the unit for proper temperature and shaking speed, alerting the user to any errors. Heating and shaking are controlled by feedback loops which precisely maintain chosen parameters, independent of load or voltage fluctuations. 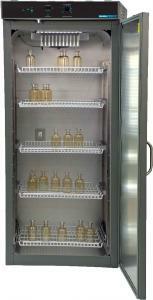 The sturdy construction of the VorTemp 1550 gives it stability during high speed shaking. The chamber is insulated to maintain temperature and reduce operating noise.